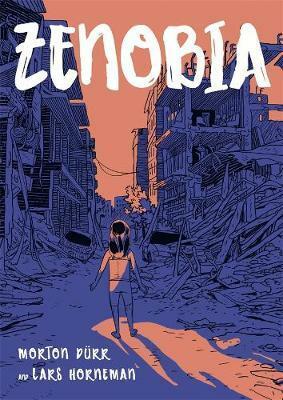 Zenobia is a heartbreaking and all-too-real story of one child’s experience of war. Told with great sensitivity in few words and almost exclusively with pictures, Zenobia is a story for children and adults. This heartbreaking Danish graphic novel calls our attention to the thousands of people who each year go missing or die during migration, particularly those deaths that happen at sea. Millions of Syrians have fled their country since the onset of war and this is the story of Amina. Her parents gone, she starts a journey. A crowded boat capsizes and as she falls into the deep blue ocean Amina thinks of hide and seek, and of cooking dolmas with her mother. She also thinks of Zenobia, the ancient queen of Syria, a warrior of inspiring strength. Readers are given plenty of space to reflect on the heavy events of this book. The text is very sparse; wordless pages and large panels highlight the vastness of the sea and the journey. It’s a powerful, vividly illustrated book and will be useful in a classroom or at home as a starting point for discussion about the Syrian refugee crisis.